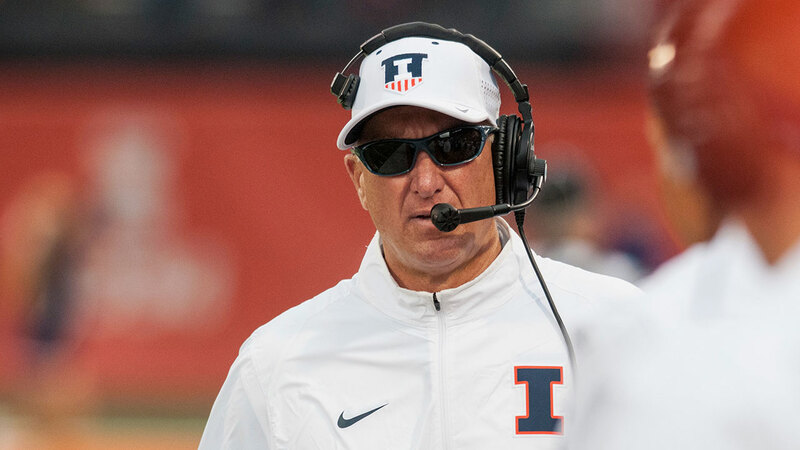 CHAMPAIGN, Ill. -- First-year football coach Bill Cubit was fired Saturday by new athletic director Josh Whitman, who said the troubled program needs a new coach to work toward long-term success. The move came the same day Whitman told a Champaign radio station that men's basketball coach John Groce will return next season. Whitman said in a news release that he appreciated Cubit's work as interim coach last season after the firing of Tim Beckman. Cubit, who was hired as the permanent head coach in November and received a two-year contract, said he was stunned by the news. "I just came in and (Whitman) said, 'I'm letting you go,'" Cubit told The Associated Press of the meeting on Saturday. The move comes during almost a full year of turmoil at Illinois in football and other sports, including allegations of player mistreatment that led to the firing of Beckman. Previous AD Mike Thomas was fired in November, and there's an ongoing lawsuit by seven former women's basketball players alleging a racially abusive environment. Whitman announced the firing in a statement Saturday, just a few hours into his first official day on the job. He was hired last month from the same role at Washington University in St. Louis. "I appreciate the leadership that Bill Cubit provided our football program during what has been, unquestionably, a very tumultuous time," Whitman said. "Bill is a good man and a good football coach. All of us in the Illini Nation owe him a debt of gratitude for his work leading our team these last months. "At this juncture, however, I think it is most important that we position our program for long-term success by creating a more stable environment for the coaches, players, and prospective student-athletes." Whitman planned a news conference Saturday on campus. The Illini finished 5-7, 2-6 in the Big Ten last season under Cubit, whose son Ryan was also fired as offensive coordinator. The elder Cubit said he wasn't given a detailed reason for the firing. "Everybody told me I had (at least) this year," he said. "There's a lot of shock going on. I don't know what to tell you. It's a funny place." Several players took to Twitter to complain that they learned of Cubit's dismissal through social media. "Love finding out about this through Twitter," said Mike Dudek, the Illini's top receiver. Cubit said some players told him a team meeting was planned for later in the day. Other players voiced concern about the turmoil in the program. "Haven't Even Been On Campus A Full Year & Have Had 2 Head Coaches. Now Going On Number 3," starting running back Ke'Shawn Vaughn said on Twitter. The university said in the release that Cubit will be paid $985,000. Ryan Cubit will be paid $361,000, the remainder of his contract. The release said spring football, due to start March 11, will be postponed until a new head coach is hired. Whitman plans to name a new head coach "as soon as possible." Cubit took over as interim coach in late August, when Beckman was fired just a week before the 2015 season started. Beckman lost his job after a law firm hired by the university to investigate allegations of player mistreatment concluded the head coach had interfered in medical decisions and pressured players to play through injuries. Beckman has denied those allegations. The lawsuit against women's basketball coach Matt Bollant, Thomas and the university is ongoing. Another law firm hired by the university found no basis for the allegations. But Bollant, whose team just finished a 9-21 season, remains under pressure. When Thomas was fired, interim Chancellor Barbara Wilson said he had done nothing wrong. But she said the entire athletic program needed new leadership.